Wedgie's wonderful world: Happy Saturday! Hello there - I hope you are keeping well! Today is the weekend before Halloween and today I am hosting a Halloween crafternoon tea at my house for my friends. I love creating Halloween themed afternoon teas, I think they are great fun and you can get very creative with your sweet treats! There will be lots of photos on my afternoon tea blog very soon! Today we have a lovely challenge for you over at Sweet Stampin...this week we would like to see your projects featuring wood, trees or leaves. The image has been stamped in black ink and I have added a bit of sparkle to the leaves with my Stickles. 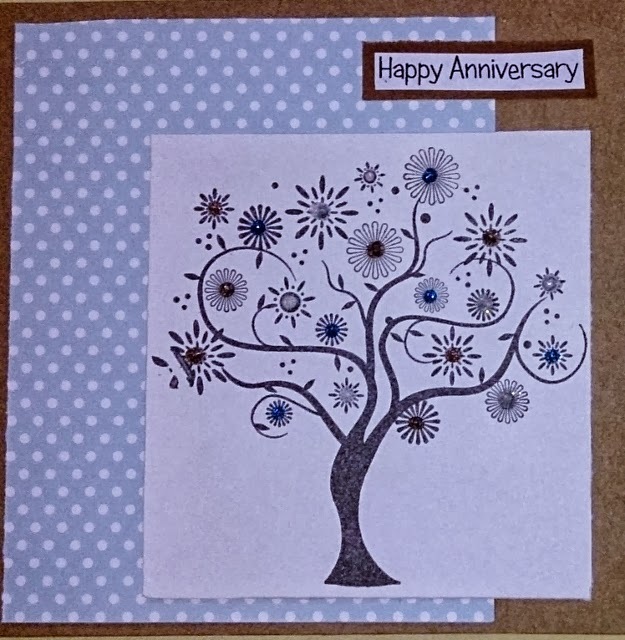 I've gone with a lovely brown and blue colour combo for this card, featuring some cute polka dot backing paper! This is a gorgeous tree Wedgie, and a fabulous card. Just love this tree image. Gorgeous touch of "pearls" stickers. Great card Wedgie. Think I'd have been struggling with this challenge. What a fabulous stamp, Wedgie! Lovely card! What a fun image, I can see that you could do a lot with this! Great card!